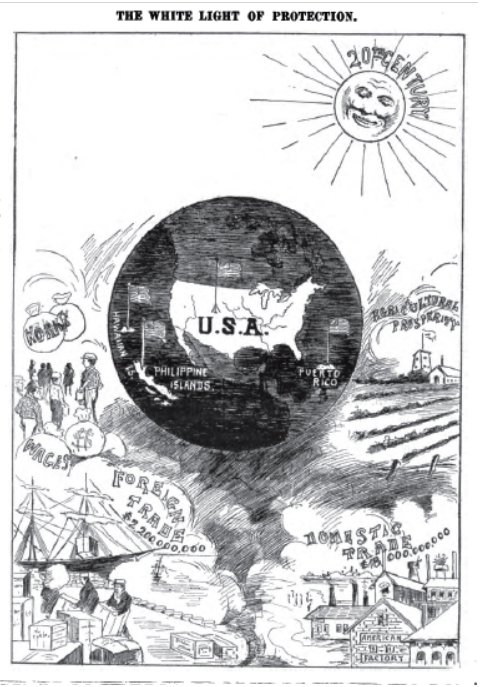 A pro-Republican cartoon from 1900 depicting “the white light of protection” shining down upon America’s newly acquired empire at the dawn of the 20th century. American Economist, 28 Dec. 1900. The liberal economic order that defined the post-1945 era is disintegrating. Globalization’s foremost champions have become the first to signal the retreat in the wake of the Great Recession. Economic nationalism, historically popular in times of economic crisis, is once again on the rise in Britain, France and the United States. We are witnessing a return to the antagonistic protectionist politics that defined a bygone era that ended with World War I — suggesting that today’s protectionist revival threatens not just the global economy, but world stability and peace. Leading liberal democracies have turned their back on free trade. Britain, through Brexit, announced its retreat from European market integration. Before the parliamentary elections, British Prime Minister Theresa May announced a new Industrial Strategy, which includes state subsidization of select industries and stringent immigration restrictions on foreign workers at “every sector and every skill level.” Despite her post-election collapse in support, May continues to move forward with leaving the European Union single market thanks to an unholy alliance with the Democratic Unionist Party, Northern Ireland’s far-right supporters of Brexit. Likewise, in the recent French presidential elections the vast majority of candidates ran on a platform of “patriotisme économique.” Marine Le Pen, leader of the French far-right National Front party, made a strong bid for the French presidency through a campaign that combined a condemnation of globalization alongside the promise of extreme economic nationalist legislation and an end to immigration into France. President-elect Emmanuel Macron is now pushing hard for a “Buy European Act” to placate French anti-globalization forces. But nowhere has the anti-trade turn been more marked than in the United States, where “globalism” has become a dirty word. “Free trade’s no good” for the United States, as Donald Trump put it in 2015. President Trump has threatened to shred the North American Free Trade Agreement and to impose protective tariffs on imports from Mexico and China, two of America’s largest trading partners. In January, a paranoid Trump pulled the United States out of the Trans-Pacific Partnership negotiations — a massive free-trade deal that included a dozen countries in the Asia Pacific — because he believed that the Chinese were secretly plotting to use it to take advantage of the U.S. market. And in April, Trump signed a “Buy American, Hire American” executive order that forces U.S. government agencies to purchase domestically made products and limits the immigration of foreign skilled workers.